"While making my way to Manila, expectations were high of the thought of working with a highly acclaimed VIDES chapter where I could use some of my talents and past experiences, and hopefully learn about serving others and the positive impact of VIDES projects on their community. What I found was even more than what I had expected! I was blessed to have been chosen to serve in the Philippines. I had great joy in using my background in Business to work on office projects and tasks, including the VIDES Philippines Project Proposal, the Busina Mo, Dunong Ko Mobile Education Project Module Volunteer Handbook and brochure, and several other small projects to assist the office staff. I also naturally offered to lead the planning for the Annual Sports Fest, because of my enthusiasm for sports. While joining the “Busina Mo, Dunong Ko” Mobile Education Project for urban street children, I provided tutorial services in major academic subjects and assisted with values formation and group activities. I traveled five days a week to six areas in Metro Manila where the children were given the chance to actively participate in lessons and receive personal attention they aren’t able to receive from the public education system. I got to know these kids personally, and I am grateful to them because they have opened my heart to the beauty of this country. Because of them, every future endeavor I embark on will be done with greater passion because of the responsibility I feel to use my gifts and opportunities to the fullest. In some small way, my accomplishments will mean more to me because of these kids to whom I wish I could give the world, but the most I can do is to live my life abundantly. They have shown me the strength of a survivor with the heart to love deeply. The faces of these kids are hard and tough on the exterior, but somewhere deep inside they are yearning for something more, an unconditional love. I got to see glimpses of the extraordinary people they will become during brief interactions which revealed a transformation in attitude and behavior. I will forever look back on our time together with great joy and remember the profound love that I felt for the children of which I have never experienced before. I will never forget and will always pray for their futures, and hope to hear of their great success stories. After two months of tutoring the BMDK kids, I began to teach my most enjoyable lessons; instructions about the basics of playing soccer. 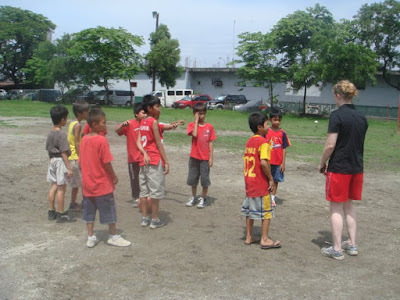 I coached more than 60 kids on their busy streets with one ball and makeshift goals. Each and every day I looked forward to the kids shouting to me, “Ate Tessa, Soccer?” The summer sessions culminated in a soccer tournament at the annual Sports Fest which each area competed against one another. 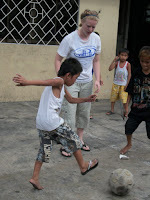 I feel a special connection with those players and will always have a special place in my heart for “my” soccer kids. The kids revealed to me how incredible it feels to watch pupils improve and to observe them love and find passion for what I love. I now recognize that the means through which I can teach and inspire kids will probably not be with books, but with a ball. This realization was re-emphasized during our trip to the Azkals game, as I saw their excitement building on the drive to the game and jumping around giving me high-fives as the Azkals defeated their opponent. 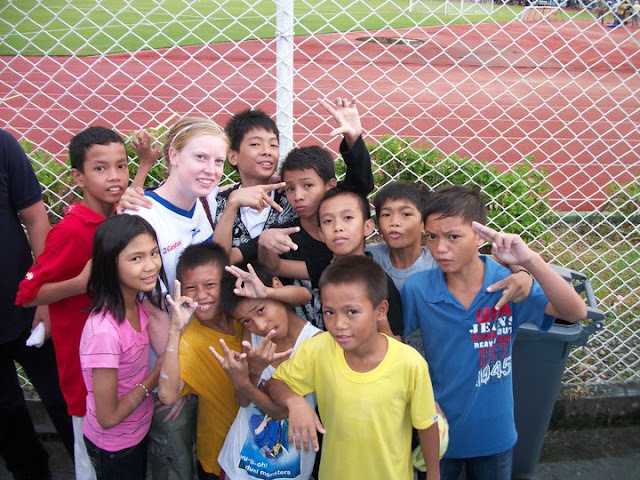 The other passion that I discovered here in the Philippines was a deep concern for the poor. I feel a mission and newly-discovered motivation to help communities find the desire and means to escape the cycle of poverty. I learned how wonderful and insightful the VIDES community members are, but how much the children need something greater to hope for and someone to model for them the love that Christ has shown us. I believe so strongly in the power of the Mobile Education project to change communities, and with constant new ideas and growth, one day soon the six areas will be completely new places from when VIDES first started there. I am grateful to have been able to see many different places in the Philippines and challenged to share my life and time with others. 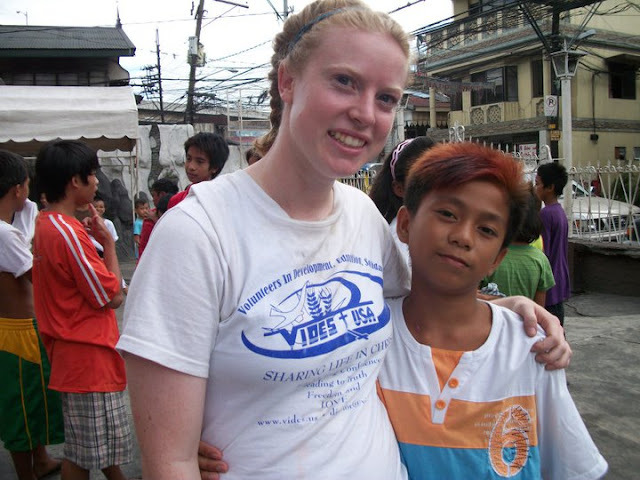 The most significant experience I had traveling was to Palawan for the annual Mission Camp. The Mission Camp was a beautiful experience where I was able to witness over 50 other volunteers giving their time and all their love and effort in providing services to a community in need. The local sister’s dormitory graciously accommodated us as we served 300 patients at the Medical Mission and 100 persons for haircutting services. A total of 400 children and adults attended the inputs on health and human rights and received school supplies, clothes and food. Throughout the afternoon we heard the cries of 30 goats reluctantly going with their new owners through the Kambing Mo, Kabahayan Ko livelihood project. Just before our blessing of the new VIDES BMDK multi-cab given to the Palawan community, we shared a mass together to celebrate our unity with the community and from where the inspiration from which we give comes. Another group that was surprisingly admirable and taught me a number of lessons was the out-of-school-youth attending the Alternative Learning System. The ALS is a literacy program of the government adapted by duly-accredited schools and intended for children who have been deprived of primary education due to poverty, child labor, abuse and/or neglect. While attending the daily evening classes and providing one-on-one tutoring and occasional lessons, I was able to understand the beauty of this method of learning. The program is the modern representation of Don Bosco’s vision of taking children off the streets and showing them a positive alternative to their current path in life. The students have found something that gives them hope and a chance for a bright future; along with values formation for living a life in Christ which God has planned for each one of them. I have witnessed how love can change lives of young people with just one person who cares and expects something of them. I am full of admiration for all the sisters in the Don Bosco School community, Manila and the whole province. They have shown me hospitality unmatched by anyone I’ve come across. Their interest in my experiences in the Philippines has been a great comfort during this year away from family and friends. Their presence and fun-loving attitude has made it easy and enjoyable to be around. Through their actions I have learned many valuable lessons that I hope to hold onto and share with others. I have seen the beauty of community, and of devotion in religious life. I am particularly grateful to Sr. Jojo, VIDES delegate, who has tirelessly worked to develop VIDES into a highly respected and effective volunteer organization. VIDES, nor my experience would not be the same without her. It would also have been incomplete without the companionship of Sarah, Rhea, Varry, Melvin and Amy from the office for accepting me into the VIDES family and becoming great friends. I was constantly motivated by their dedication to work harder in my own tasks. I thank everyone for this unforgettable once-in-a-lifetime experience to serve. Maraming Salamat Po."